In 2004, the world was home to about 9,000 Blockbuster outlets. By 2013, the last remaining corporate-owned stores had closed, but privately owned locations were able to license the Blockbuster brand. BEND, Ore. — This growing city is now home to an unlikely tourist attraction: a Blockbuster video store. At all hours of the day, customers and tourists can be seen posing in front of the store's famous blue and yellow sign. 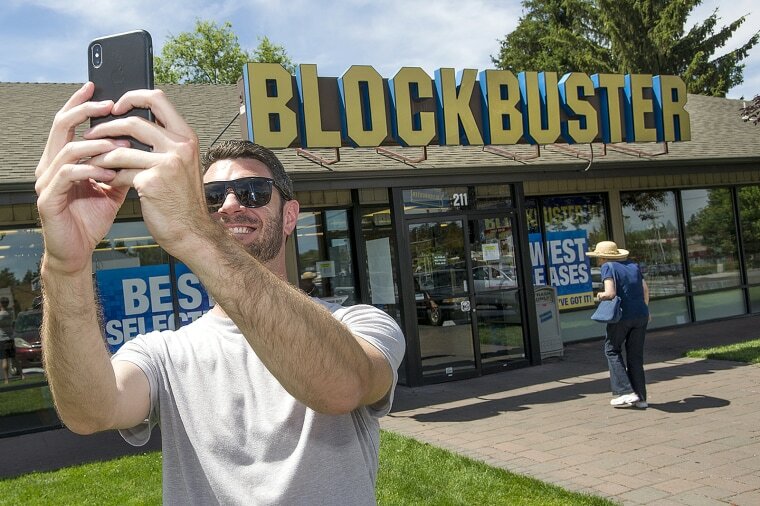 "We're here visiting Bend, and my friend said, 'They have the last Blockbuster. You have to go get a picture,'" said Judi Medeiros, as she snapped photos of her kids striking a pose. The Bend store earned that distinction — the last Blockbuster — because the only other two remaining stores, both in Alaska, closed their doors this week (although they will be selling off liquidated material through August). The last Blockbuster in the U.S.
"I'm sad, but I'm happy there's a sole survivor," said longtime Bend customer Simon Birmingham. "It has been an icon for my life." Despite competition from streaming services like Netflix, Amazon Fire, Apple TV and Redbox, a chain of DVD-rental kiosks, business is still booming at the Bend shop. Jessica Hannah, who was visiting from San Diego, brought her kids and nieces to the Blockbuster. It's the first time any of them had been inside an old-school video store. All they knew was Redbox. "Why does Redbox only give you 50 choices? Because they can only fit so many in that box," Hannah told the kids. "Here you have a whole entire store. This is way better, isn't it?" In 2004, the world was home to about 9,000 Blockbuster outlets. By 2013, the last remaining corporate-owned stores had closed, but privately owned locations — like the ones in Bend and Alaska — were able to license the Blockbuster brand and keep going. Sandi Harding, the general manager, has worked at the Bend store since 2004. "The social interaction you get — face-to-face talking to people, not having your nose in your phones — I think that's what you find coming into a Blockbuster store," she said. "It's a family affair, definitely," Ryan Harding said. "I mean everyone in the family has pretty much worked here, from cousins to brothers."